Stress is an innate response to a new or threatening situation. Mild stress increases alertness and is not harmful. Whereas long-lasting, strong stress increases the risk of mental and physical illnesses. One can concentrate worse, also makes you feel overwhelmed, restless or anxious. 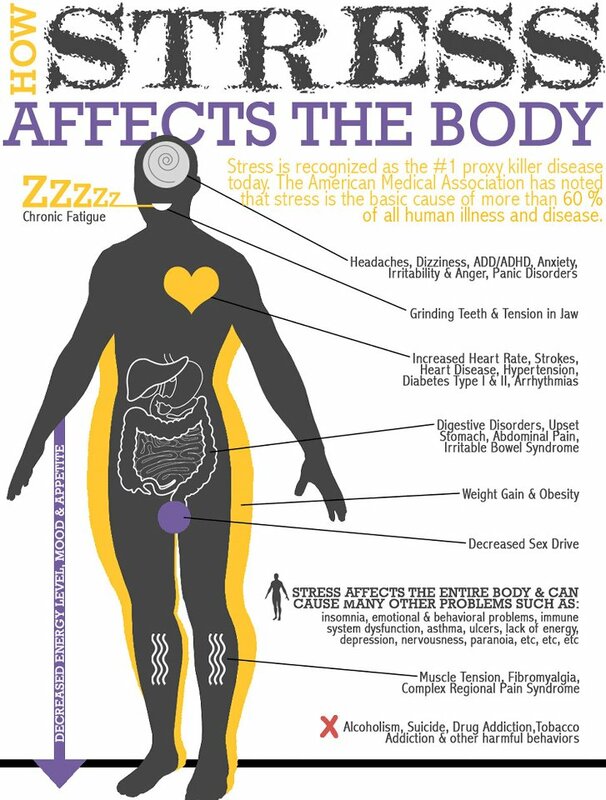 Once our brain stress registered, the autonomic nervous system is activated and the body is in a state of alarm. The body releases hormones like epinephrine and norepinephrine, thus increasing the heart rate increases, blood pressure rises, breathing is accelerated and tense muscles. Stress but also has an impact on eating habits: It suggests some of the consumption of sweet and fatty foods. Other people get down another bite them suggests the stress on the stomach. Studies show that stress makes you fat, even without additional caloric intake. It can be eliminated and the stress tolerance can be increased through exercise. It is especially important that you relax (eg music, reading, sports). But food can also act against stress (such as avocados and soy products). Take care of yourself and your body! Untamed stress makes you sick!